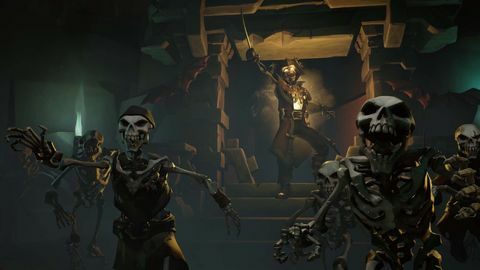 Can Sea of Thieves reclaim the word "booty"? Matt investigates. 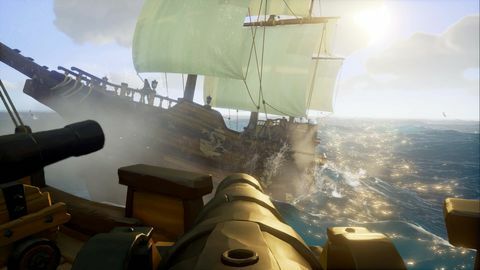 Sea of Thieves’s inspiration trickled in from an unlikely source: shared-world games like Destiny and The Division. “We looked at what was out there that we could apply the Rare charm and humour to,” continues Mayles. And when it came to small groups co-operating and adventuring together, “pirates just fitted”. It just works, too, and that’s thanks to some clever design that emphasises accessibility in the best possible way. The bright, friendly visuals set the tone, and even without a tutorial of any kind in place, it’s easy to get started. Our E3 demo opened on a beach with a ship floating in the distance. What else are ya gonna do but climb aboard and sail? A single contextual button press performed most actions once on board, and the inventory system was clear and simple. 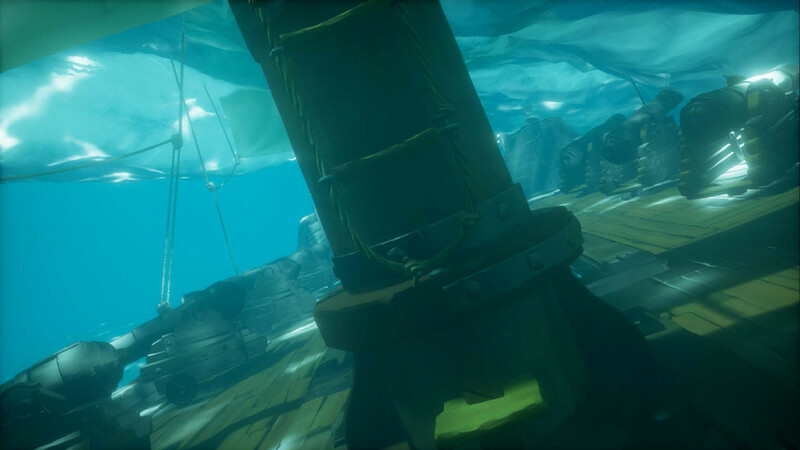 Rare wants players to choose their own goals and play as they want to, but not be mired down in menus. “All our mechanics are designed to get players together,” says studio director Craig Duncan, and by that he means both friends and strangers. Ships are extremely tough to sail alone. Whoever’s on the wheel can’t see out front thanks to billowing sails, so it’s handy to have a crew member in the crow’s nest, guiding things over the game’s proximity voice chat system. The anchor can be dropped when in harbour, and it’s also useful for pulling the ship equivalent of a handbrake turn, but it takes a stressful half minute to raise it again, even with several players manning the chain. Working the sails is equally intensive, and they can also be angled against the wind to reduce or increase maximum speed. Our basic vessel had three cannons on both port and starboard too, and it would be rude to not recklessly fire hot iron at passing seagulls every once and a while. Finally, it’s also important to be able to rush below deck to patch up any cannonball sized holes below your craft’s waterline – something that’s tough to do when you’re worried about guiding your Jolly Roger into a rock. In other words, lone wolves need not apply. 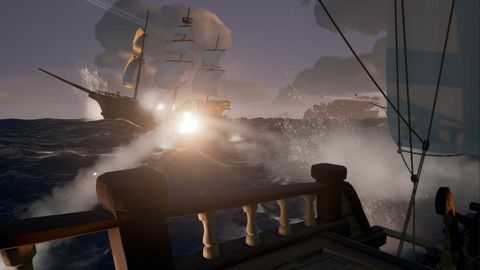 Sea of Thieves seems to be a good fit for a crew of friends though, and also one that will be perfect for Xbox’s upcoming Looking For Group feature. Using that app, you’ll be able to advertise your play style, goals, or motivation, and with any luck quickly find like-minded individuals keen to carve up the high seas. 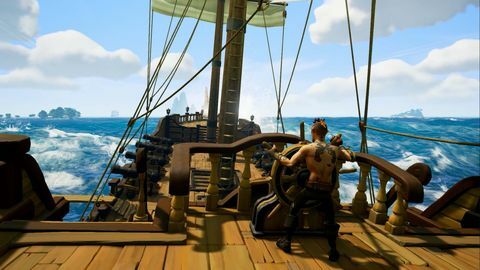 Speaking of, Rare insists that Sea of Thieves will be a game that accommodates many play styles. After all, some people wanna be notorious, some wanna find treasure, some wanna chart the world, and some just wanna get hammered on rum. “There’s no Blackbeards or Black Pearl,” says Mayles, “we want players to become these things. That makes every time you play unique.” It’s safe to say that those motivated by exploration, combat, and customisation will be catered to, at the very least. My demo time was spent crewing with an Aussie friend, two Yanks, and one of the devs, and a rapport developed instantly as we tried to get our mighty vessel moving. With sails unfurled and anchor up, we charged out into the open ocean, some idiot Kiwi navigating from the crow’s nest. Everyone was grinning immediately – accomplishing the simple goal of getting moving had already made friends of strangers. Between scans of the horizon I bowed a jaunty tune on the fiddle in my inventory, before discovering that I was also carrying beer. I don’t want to get into the finer details of what happened next, but let’s just say I took dive from the top of the mast into the churning water below and had to be rescued, drinking vessel still in hand. It was university all over again, but I hadn’t thrown up in my brand new bed. Soon, rival crews (also playing on the E3 floor) were upon us. Cannons roared and sailors scattered, nailing planks over hull breaches and yelling “port!”, “hard starboard!”, and "crikey!" (bloody Aussies) to our Captain in an attempt to get the best angle on our adversaries. Cannons are remarkably tricky to shoot well: there is no helpful trajectory marker of any kind, and with the ship cresting waves and crashing down into troughs, a hit on anything not actively investigating the inside of a barrel is cause for jubilation. Just as we shredded a rival’s flank with our guns while another bore down on us at ramming speed, the screen flashed to black – our demo time was up. Some extremely pirate-y language probably made it as far as the Forza booth at the very least. 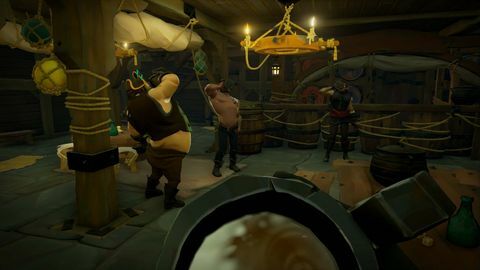 Rare isn’t talking business models yet, but it seems a no-brainer that Sea of Thieves will be free-to-play. A game so dependent on encounters between players needs a strong player base to thrive, and getting crews on your barnacled ride will be easiest when there is no sunk cost. 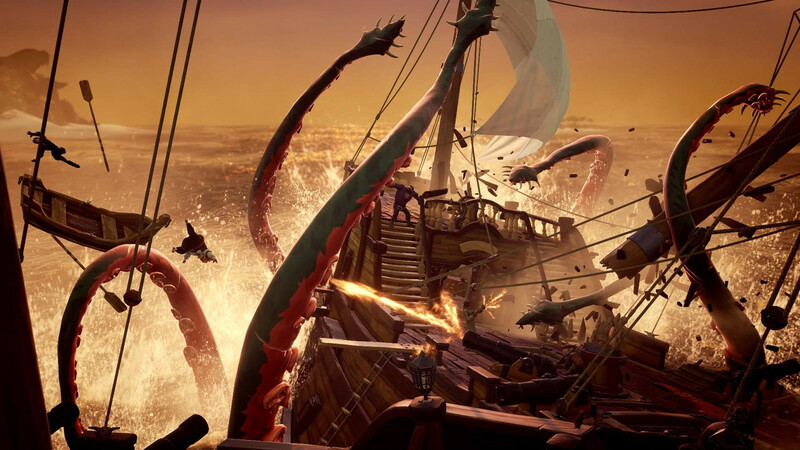 Whatever the case, I can’t wait to see more of Sea of Thieves. The player reactions in the E3 gameplay trailer feel contrived, but the fun in this one feels real.